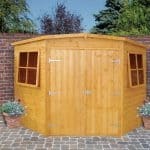 This 8 x 6 overlap cladding garden shed provides excellent value for money. You will appreciate the overlap cladding because it literally stops rainwater from getting into the building; therefore increasing its longevity. The shed also has styrene-glazed windows which are safer and more durable than conventional glass windows. An apex style roof completes the weatherproof features, ensuring your shed is kept completely safe and dry all year round. 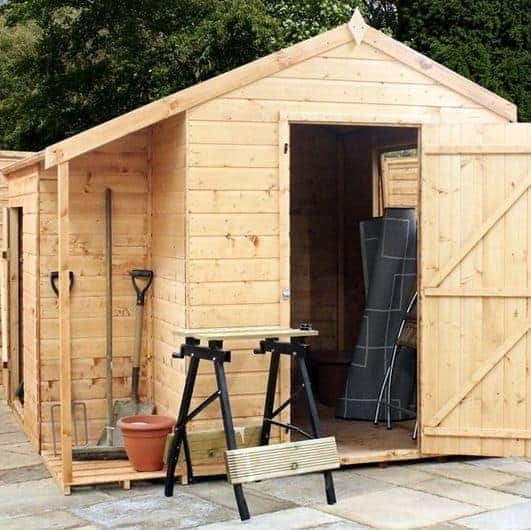 This is a medium sized apex storage shed which provides a good amount of space to store everything from gardening equipment to bicycles and light machinery. The apex roof helps to give the building a traditional, attractive look whilst adding practical benefits. It is one of the best water resistant roofs used by manufacturers and Waltons have included free sand roof felt to give it extra rainwater protection. The roof has an extra-large height measuring 1.94m. The eaves are also tall, measuring 1.47m in height. Other building measurements include a depth of 2.37m and a width of 1.78m. 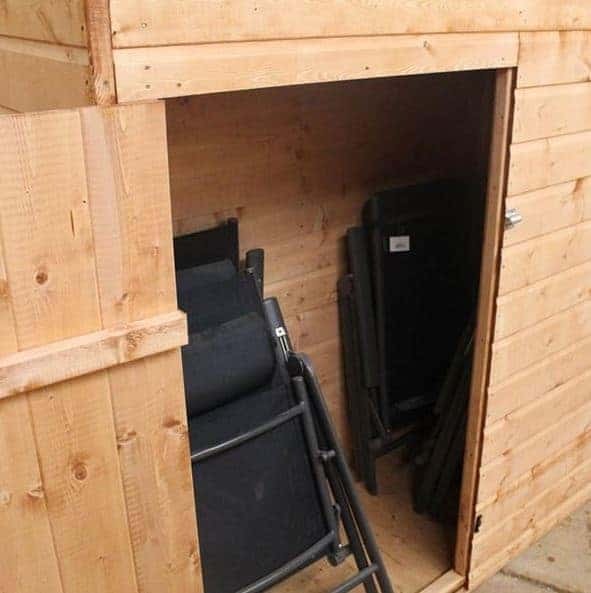 The door measures 0.75m in width which isn’t overly large, but still provides enough space to enter the shed comfortably. It also measures 1.65m in height. In order to maintain its ultra-value, this shed is built with overlap cladding. It is cheaper for manufacturers to use so those cost saving benefits are passed on to the customer. Whilst it may be cheaper, it still provides a good level of protection. The boards overlap to create a secure, water-tight seal. However, it does need to be treated in order to become fully waterproof. You also need to keep in mind that it is likely to warp over time if you construct it in a sunny part of the garden. It uses standard 28mm x 28mm framing so the structure is pretty solid. However, the floor isn’t as durable as it could be. It consists of a 10mm solid sheet board which is sturdy if you aren’t going to be storing anything heavy. However, it is highly recommended that you invest in an extra strength floor support pack. This will take the price up slightly but the extra support is definitely worthwhile. While the shed has actually been treated with a water based solution, it still requires an additional treatment after construction. This is because the treatment given prior to shipping is designed to protect the shed during transit. In order to fully protect it from the elements it needs to be treated with a deeper solution. In fact, if you read the terms and conditions of the 10 year anti-rot warranty, you will see that it’s actually a condition of the cover to use a spirit based treatment. These are designed to penetrate through to the inner layers of the timber, rather than just the outside. 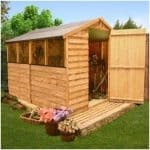 It is also important to continue to treat the shed annually or in accordance with the manufacturer’s instructions. 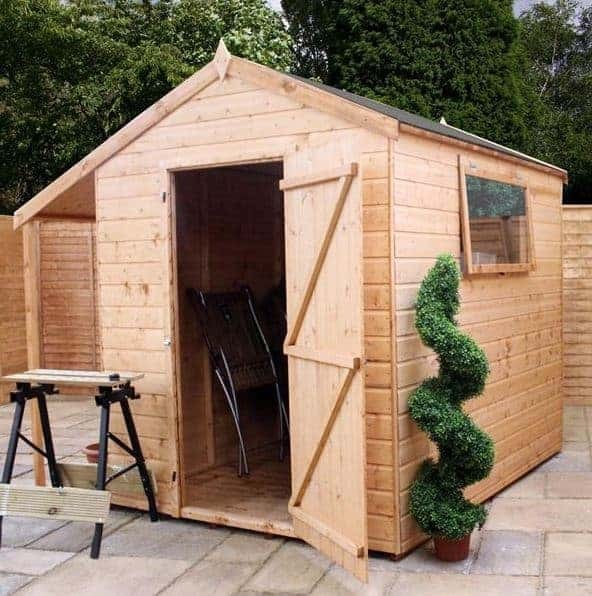 The shed comes with a single, ledge door which gives you the opportunity to fit a staple and hasp. There is also a fitted turn button lock which helps to keep the doors properly closed, even in high winds. There are two windows included in the design and we like that you can choose to have them on either side of the shed. 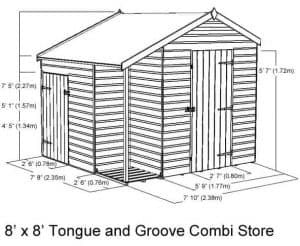 It gives you total flexibility in terms of shed placement. They are also styrene glazed which is an alternative to glass. 100% shatterproof, they are safer than glass; particularly if you have small children. The one thing you do need to be aware of is that this shed isn’t very secure. You can invest in a few extras that can help to enhance its security, but of course that involves spending more money. The turn button lock only keeps the door from opening on its own; it doesn’t actually stop people getting in. So we highly advise against storing anything of value in the shed. It also doesn’t provide any privacy. The two windows allow people to look through and see the contents of the shed. So again, don’t store anything valuable unless you want them to get stolen. If security and privacy is a major concern of yours then this might not be the best model to opt for. The biggest customisation option on this shed is the option to have the windows on the left or the right hand side of the building. This can be decided when you’re putting it together. However, there are a couple of additional customisation options you can opt for before you buy the shed. The first is an extra strength floor support pack. This is something we do recommend if you have a lot of items to store. The solid sheet materials are sturdy, but they won’t hold the weight of bulky, heavier items. The second option you have is superior duty felt. This is made from tough fibre glass and it provides excellent protection in all weathers. As standard, the shed comes with heavy duty felt. This does provide good protection, but as the building is made from overlap cladding, it could be worth adding a little extra protection to ensure it really lasts. 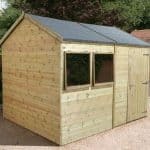 Waltons also offers various extras that you don’t necessarily need, but that can maximise the strength and function of the shed. If you are interested in making it more secure, there is a weatherproof padlock with staple and hasp that you can invest in. A particularly good extra to consider is the Waltons 8×6 Portabase. In order to ensure your new shed is fully supported, it needs to be built on an even, solid surface area. It isn’t always easy to guarantee this and unless you want to spend hours digging and levelling out the surface, the Portabase can give you great peace of mind. 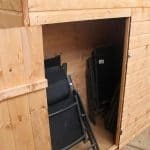 Other extras available include various timber treatments, a lean to kit and draper accessories. The lean to kit is the most notable as it adds additional storage on the outside of the building. It is more like a canopy where you can store anything from your garden bin to gardening shovels and spades. The shed may be simplistic but you can’t fault its quality. Only the best materials are used. With overlap cladding you have to keep in mind that it isn’t going to be as durable as tongue and groove. Therefore it isn’t going to last as long. However, if you regularly treat it with a good quality preservative, it should last at least 10 years, hence the warranty. 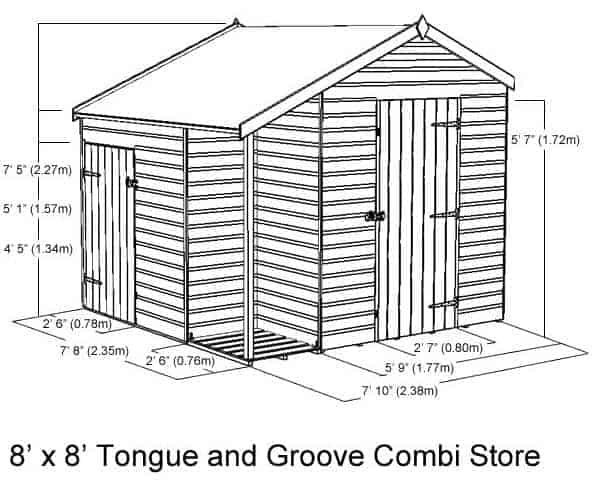 As a mid-size shed, it does provide a good amount of storage that will suit most people. Internally it offers plenty of height too which is great for taller items. 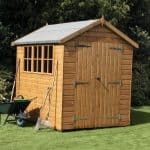 Walton’s sheds are always pretty straight forward to assemble. However, there are a few tricky parts to be aware of. Fitting the solid sheet materials can be a little fiddly and the panels can be quite awkward to handle. It is for this reason it is recommended as a two person job. The whole design of this shed has been created with value in mind. It is one of the most affordable models made by Waltons, yet it still benefits from tough overlap cladding. If it wasn’t for the regular treatments required, we would have given the shed a higher score in this category. 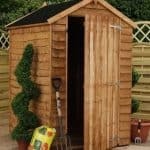 Final Thoughts: If you’re looking for an affordable, high quality shed then this is definitely a good contender. It provides exceptional value for money and a decent level of storage space. The only thing that it doesn’t provide is a great deal of privacy or security. 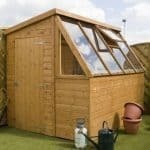 So you will need to consider just how secure your garden is and whether you need to invest in additional security measures.